Not content with my freakish baby drawing, I decided to draw one of my favourite songwriters & singers, Nick Cave. This was drawn from the album cover of The Boatman's Call. When I listen to his music I feel darkly luminescent, electric. Not sure this drawing captures that at all, but here it is anyway. Mr Cave is meant to be scary. You really captured his darkness. For someone with a very limited amount of training in the fine arts, your work displays a strong, confident line! Nice job! Nick the stripper! is a ripper. Nice job, he has a great face to try and draw. 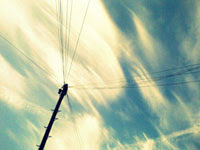 I am playing a guess that song game on my blog, pop by and hazzard a guess! Yeah, fantastic. Dark, rough, and brooding. Perfect edge to compliment the subject. 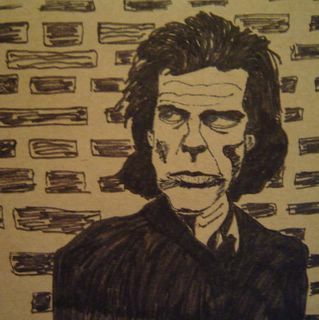 I've never heard of Nick Cave, but looking at your drawing of him, I don't believe he's anyone I'd ever want to meet! But he does look like someone I'd like to have on my side if I ever get into a fight! Shiver me timbers! As was noted, Mr Cave is meant to be scary, he's famous for his darkness, he wrote some fantastic "murder ballads", but also has a softer romantic side. Wonderful singer and songwriter.